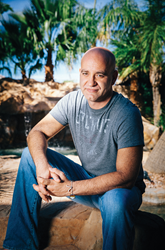 This ex-addict is a high-profile DJ, his house is in Henderson and his remedies are all-natural. Enter Justin Hoffman and his newly opened Holistic House (HolisticHouseVegas.com). The 46-year-old ex-Light Group music programmer’s alternative to the sober living model pairs natural remedies such as herbs with daily yoga and meditation to transition recovering addicts through the rough period between detox and normal life. Take a tour of Hoffman’s home, and you’ll find it’s vastly different from other sober houses and rehabs. It’s got the kind of easygoing sanctuary vibe that complements Hoffman’s natural remedies. It has high ceilings, earth tones, a grand staircase and wafts of sage smoke. “Holistic House wants people to feel like they’re at peace when they come here, instead of a low-level prison; treating them like human beings, especially when they’re going through so much.” Clients can use boxing dummies to let off steam and a swimming pool to unwind. Hoffman’s path to recovery post-Ibogaine—what he calls “after-care”—comprises a rigorous schedule of daily yoga, exercise and organic, home-cooked meals. Hoffman does have to limit the number of clients, though. He argues that it’s an issue of quality control; he wants to make sure each person receives the optimal amount of care on their paths to recovery. For any more questions, please contact Justin through email at service(at)holistichousevegas(dot)com.